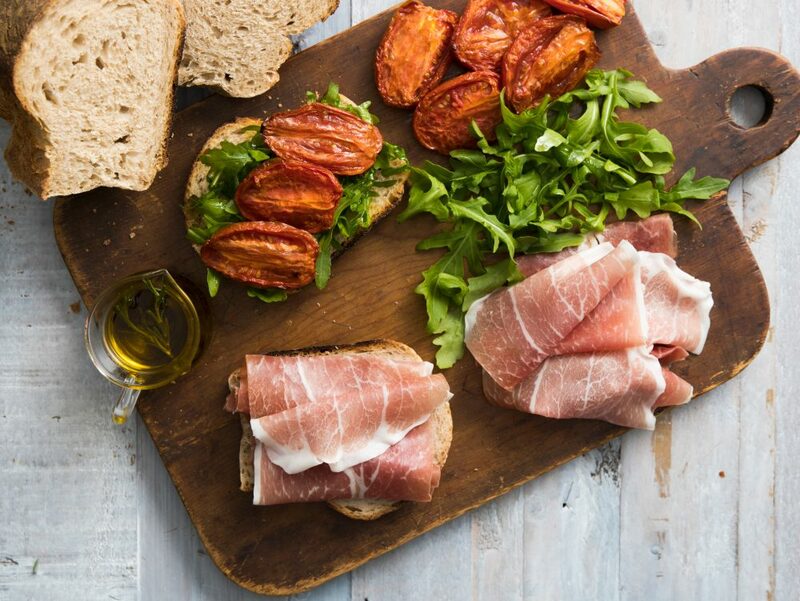 Grab a loaf of crusty bread, savory Prosciutto di Parma and fresh tomatoes to roast for one incredibly simple and delicious prosciutto sandwich. This one is perfect to pack for an outdoor picnic, or appreciate it as an easy dinner for a quiet night in. Not to mention it’s easy enough to make it your own by adding any additional toppings to really make it the ultimate prosciutto sandwich. Complete it by serving alongside a classic wheat beer to add a light citrus flavor to the sandwich without weighing it down. Most importantly: enjoy! Preheat oven to 400 degrees F. Place halved tomatoes on baking sheet, cut side up and sprinkle with salt and pepper. Drizzle with olive oil. Roast until tender, about 30 minutes. Place Prosciutto di Parma, arugula and tomatoes on bread. Drizzle with extra virgin olive oil. Add salt and pepper, if desired.